Heat ghee in a pan, add cumin seed, red chillies , sliced garlic & saute few mins. Add boiled rice , salt & mix well. Serve hot with any curry dishes. That's a quicky and garlic is always welcome. MMMM mmmm mmmm , mouthwatering. hi, never tried garlic fried rice..its different. Different fried rice.nice to see. quick and tasty rice, ready in a jiffy. 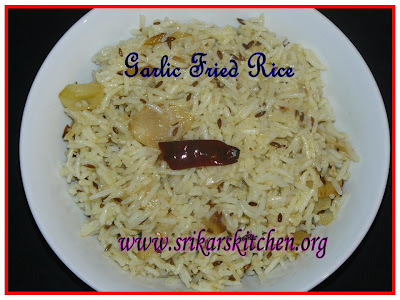 Garlic fried rice சூப்பராக இருக்கும். I love the flavor of garlic, this is a great recipe! cool dish..my husbands loving dish..
Like garlic flavour. Simple and yummy. I just love the garlic flavor in my food. nice recipe priya. Nice, garlic is such an awesome flavor!